This red brick house was named after the first Duke of Buckingham, for whom it was built in 1702. It was owned by George III and Queen Charlotte and was the birthplace of most of their children. 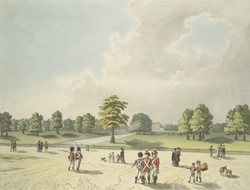 As can be seen in the drawing, its grounds face on to the Mall, which was a popular avenue for walking. It was later replaced by George IV to build a grand new palace on the spot.